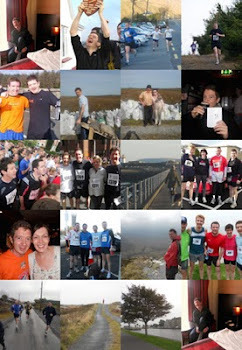 Ard na Bleaistéirí - part of my 'up and down the road' run! Last week the Queen of England came to town and this week we welcomed Barack Obama - a red letter fortnight for Ireland of the welcomes! Inspired by the 'yes we can' speech, I decided to brave near hurricane conditions to do my 'up the road and down again', three mile route. I felt grand and the wind pushed me along up ard na bleaistéirí (the hill of the blasters). Three miles isn't huge, but it keeps me ticking along. Summer Irish courses start in two week's time and this marks the real start of summer for me. At this time we're constantly on the go with 15 students staying in our house for 9 weeks solid. Strangely though it's a perfect time to train like mad - evenings stretch along nicely and I usually have between 7-9pm free for leg stretching. That's the theory anyway... Yes I can! Blustery, Stormy, Spluttery Seas...Wonderful Run! Well, t'was a treadmill, and t'was but three miles. But still, it was better than I've been doing for a while, so, on the day that the Queen of England came to Ireland, I'm happy enough with that! My thoughts on the Queen's historic visit: well past time, and very welcome. I'm definitely no monarchist, and like most Irish men my age I was raised on a diet of waaaaaaaaay to much history (the average Irish person knows so much about the past that we could each write an indepth book on any period!). England and Ireland have had a troublesome entanglement for sure, but we've also had much to be thankful for... So, I'm buying my own Elizabeth action figure and putting her up on the mantelpiece! On our way back from Dublin, following another successful outing for the One-a-Month brothers!